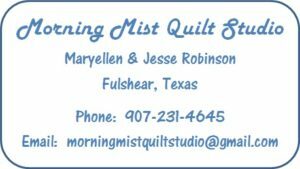 Morning Mist Quilt Studio wants to become your quilting partner! We would love to work with you to help you complete your works of art to your satisfaction. Longarm quilting – Our Gammill Statler Stitcher system is an amazing quilting tool. It is the latest in quilting technology, providing us with almost unlimited creative power. Edge to Edge Quilting – We have hundreds of patterns to choose from. Prices start at $0.02 per square inch. There are three categories of patterns based on stitch density: Regular ($0.02/sq. in. ), Heavy ($0.03/sq. in. ), and Super ($0.04/sq. in.). The prices increase because the denser patterns take longer to stitch, and use more thread. There is a minimum charge of $35 for smaller pieces like baby quilts, wall hangings, and table runners. Prep Services – Do you run out of time when it comes to preparing your quilt top for completion? We are here to help! Just drop off your quilt top and backing fabric with us and we can take it from there. We will press your quilt top to make sure all those seams are behaving and they are ready to become a beautiful quilt. We will measure, cut, and piece your backing if needed, as well as press out all those wrinkles. We also have the batting covered. We have rolls of 80/20 cotton/poly batting and 100% wool batting ready to use in your quilt.